We're all looking for comfort when it comes to dressing up, and this combination of a black leather biker jacket and a THACKE r nolita leather bag is a vivid example of that. For shoes, go down the classic route with black leather ankle boots. If you're all about feeling relaxed when it comes to planning an outfit, this combination of a dark green coat and a THACKE r nolita leather bag is right what you need. When it comes to footwear, this look is finished off wonderfully with black leather chelsea boots. Consider pairing a tan bomber jacket with a THACKE r nolita leather bag, if you want to dress for comfort without looking like a slob. Bump up the cool of your outfit by completing it with black cutout suede ankle boots. If you're obsessed with practicality dressing when it comes to fashion, you'll love this totally chic pairing of a black cutout bodycon dress and a THACKE r nolita leather bag. Grab a pair of black cutout leather pumps to take things up a notch. If you're all about comfort dressing when it comes to fashion, you'll love this absolutely chic pairing of a black satin sheath dress and a black fur clutch. Up the cool of your look by rounding it off with black leather pumps. 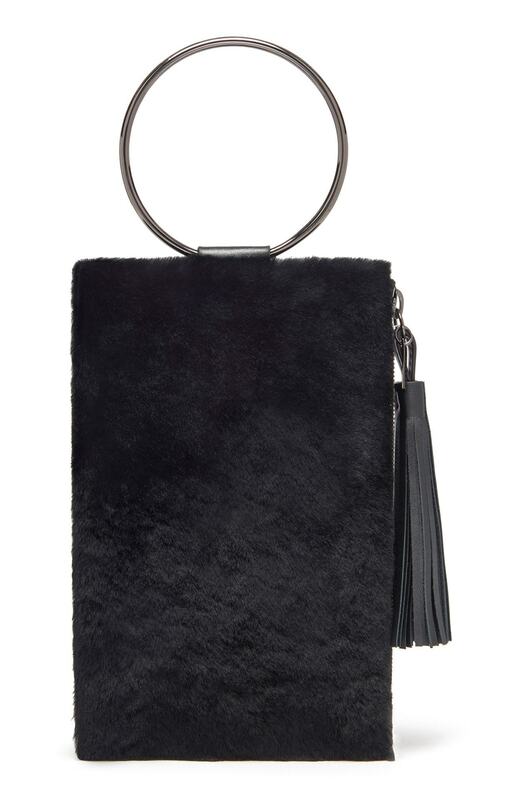 If you're all about relaxed dressing when it comes to fashion, you'll love this absolutely chic pairing of a black open cardigan and a black fur clutch. You could perhaps get a little creative when it comes to footwear and spruce up your ensemble with black suede platform loafers. If you're all about feeling relaxed when it comes to putting together an outfit, this combination of a black crew-neck sweater and a THACKE r nolita leather bag from Nordstrom is just for you. And if you want to instantly bump up the style of your look with one piece, enter black cutout leather ankle boots into the equation. If you're all about relaxed dressing when it comes to fashion, you'll love this extra cute combo of a black coat and a THACKE r nolita leather bag. Throw in a pair of black leather ankle boots to kick things up to the next level. If you're obsessed with relaxed dressing when it comes to fashion, you'll love this uber cute combination of a camel coat and a THACKE r nolita leather bag. Up the cool of your look by finishing off with black chunky leather ankle boots.